Passengers are welcome to board our ship at 4:00 p.m. After comfortably settling into your cabins, we'll introduce our crew at a welcome cocktail. Our ship will begin to sail towards Passau. 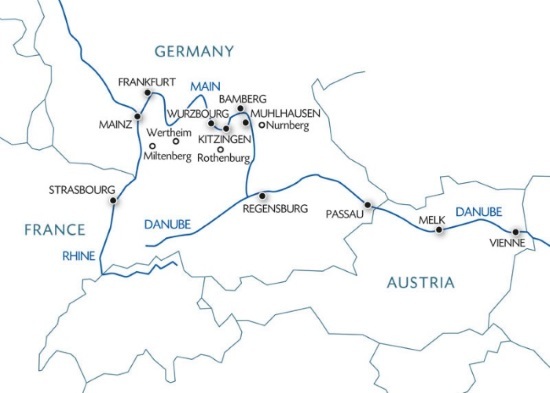 We'll cross the Strudengau and Nibelungengau regions, the most beautiful part of the Danube. Enjoy an afternoon of dancing on board before arriving in Passau. Enjoy some time on your own or join our hostess for a tour of the town. A university town with a rich musical and theatrical heritage, Passau's beautiful baroque buildings and romantic narrow streets are unforgettable. We'll return on board for dinner and continue our cruise to Regensburg. This morning, our ship will cruise towards Regensburg. We'll arrive early afternoon in Regensburg, the fourth biggest town in Bavaria and a major industrial hub for giant firms such as BMW, Siemens and Triumph. Join us for the excursion proposed: A tour of the city. After our tour, we'll return to the ship in Kelheim. Enjoy an evening of entertainment. We'll arrive in Nuremberg early this morning. Join us for the excursion proposed: A guided visit of the city. "The Treasure Chest of the German Empire”, the old town, is clustered around the old market square: Gothic buildings, half-timbered houses and townhouses. During our visit, you'll be able to taste the well-known local delicacy: Nuremberg gingerbread. After our tour, we'll return to the ship in Erlangen for lunch. Our afternoon will be spent cruising with entertainment and activities provided on board. Enjoy an evening of entertainment. This morning, our ship will cruise towards Schweinfurt. Once there, join us for the excursion proposed: Rothenburg, a magnificent walled town set up high on the hills over the river - its narrow streets lined with picturesque half-timbered houses and workshops. We'll return on board in Gerlachshausen and our cruise will continue to Würzburg. Join us for the excursion proposed: A tour of Würzburg (residence of the Prince-Bishops), nestled in a beautiful, hilly location on the river and possessing a wealth of history. Our ship will continue on to Karlstad, where we'll board it again at the end of the morning. The afternoon will be spent to cruising towards Wertheim. In the morning, join us for a tour of Miltenberg with our hostess and discover this charming, very typical German village: the market square, half-timbered houses, the Main Street and former Town Hall all ensure Miltenberg deserves its nickname of "Pearl of the Main". This afternoon, our ship will cruise towards Aschaffenburg. Join us for the excursion proposed: A visit of Frankfurt also known as "Mainhattan": the nickname was given because of the river that crosses it as well as the town's status of largest financial center in continental Europe. A panoramic tour will allow you to go up the Main Tower, the most famous all-glass skyscraper in the city. We'll return on board and continue our cruise to Mainz. Mainz lies at the confluence of the Rhine and the Main is a perfect blend of past and present. We'll arrive at the end of the afternoon, join us for a discovery tour of the town with our onboard hostess. Tonight is our gala evening and dinner. Our ship will sail towards Strasbourg through the night. This morning, our ship will sail towards Strasbourg. There will be entertainment and activities on board. We'll cruise the Rhone-Rhine Canal, passing through the locks in Iffezheim and Gambsheim, arriving in Strasbourg at 2:00 p.m. End of our services.